The day began where all the traffic merges down to Narciso Ramos Grandstand, Lingayen. As the best of the athletes stand for the country and against each other as they show off their winning talents to this year's Palarong Pambansa. Delegates fill up the stadium streaked in yellow, as everyone await for the opening activities and remarks from President Benigno Aquino, Jr.. 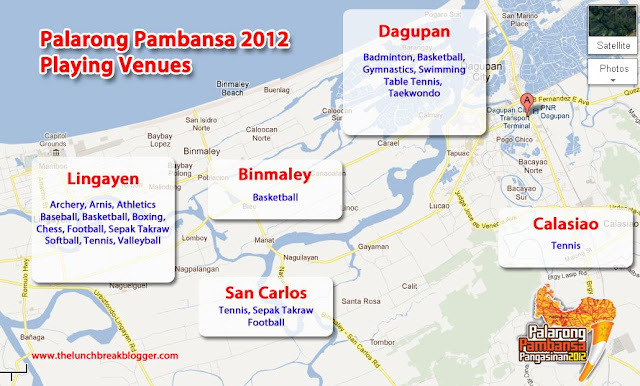 Here is a map of the whole Pangasinan region where the official events for the Palarong Pambansa will take course during the May 6 to 11 games. Gracing the opening ceremony, was ex-President (son of Pangasinan) Fidel V. Ramos, Sec. Joel Villanueva (TESDA), and Governor Amado T. Espino, Jr. who welcomed everyone. As Pres. Noynoy uttered, "Palarong Pambansa, serves to be the biggest stage where the Philippine culture showcase our gifted athletes. In the following days, we will be witness to the show of talents coming from the different parts of our country." swimming, wushu, archery, wrestling, bowling, weightlifting and billiards. With an approximate of P 2 Million or 33% of the annual remittance from the National sports Development fund were set aside for this. Indeed, it was an awe to see everyone prepared and excited for this meet, which been active for six decades. The seasoned event was truly monumental, every parents, teachers, coaches, schools are excited and should be all-proud, for from this pool of children will rise athletes of our nation which will bring us more pride and glory in the global sports arena. Why is dragon boating, ice skating and football not included in that focus sports policy. It's BS. We also need to be better with diving and other water events cuz we are surrounded with waters. Smells fishy to me.